Ambassador Giovanni Castellaneta presented his credentials to President George W. Bush in October 2005. Ambassador Castellaneta is also Ambassador of Italy to the Bahamas Islands and Italy’s Permanent Observer to the Organization of American States in Washington, DC. Prior to his current position, from 2001 until 2005, he was appointed Foreign Policy Advisor of Prime Minister Giuliano Amato and later of Prime Minister Silvio Berlusconi. Prime Minister Berlusconi also designated him as his personal representative (Sherpa) for the G8 summits. From 1998 until 2001, he was Ambassador to Australia and the Pacific Islands. From 1996 until 1998, he coordinated the international activities of the Italian Regions and was subsequently Special Envoy to Albania for the Italian assistance program. From 1992 until 1995, he was Ambassador of Italy to Iran. In 1989, he was appointed Diplomatic Advisor to Treasury Minister Giuliano Amato. Subsequently, the Minister of Foreign Affairs Gianni De Michelis designated him as Spokesman and Head of the Press and Communications Department until 1992. Prior to that time, he held various positions in Rome among which Special Assistant to the Secretary General of the Ministry of Foreign Affairs and Senior Advisor in the Office of Prime Minister Bettino Craxi. He also served in a number of other posts, including Somalia, Portugal, France, and Switzerland, as Deputy Permanent Representative of Italy to International Organizations in Geneva. Ambassador Castellaneta was Vice Chairman of Finmeccanica and is a member of its Board of Directors with special powers, on behalf of the Italian Government. He is Member of the Board of the “Italian Academy for Advanced Studies” of New York’s Columbia University. With an advanced Degree from the Università “la Sapienza” Law School in Rome (with a dissertation on “The Regions’ Control of Local Agencies”, examiner Professor Massimo Severo Giannini), he pursued further specialization in International Legal Affairs and Economics in Belgium, Luxembourg, and the United Kingdom. He was named to the rank of Ambassador in January 2002. 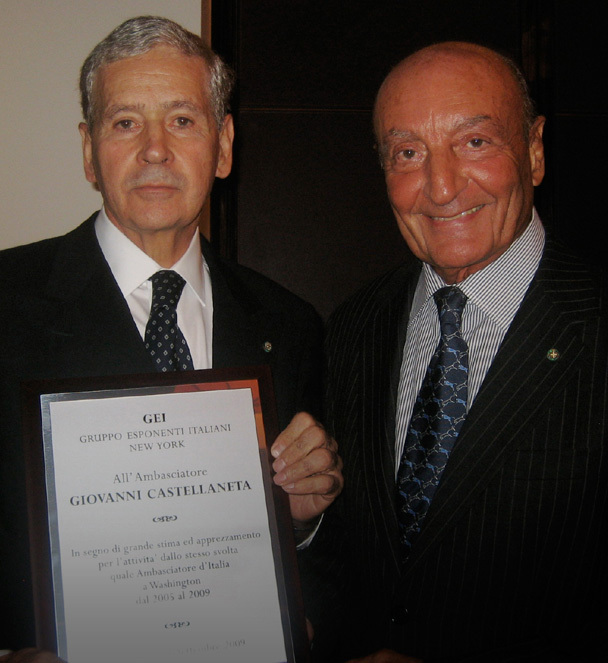 In 2005, Ambassador Castellaneta was decorated Knight of Grand Cross, the highest honor of the Republic of Italy. He has been bestowed with several foreign decorations, such as “Officier de la Légion d’Honneur”. He is a member of the Chess Club of Rome and of the Metropolitan Club of New York. The luncheon was held on September 21, 2009 in the Stella Private Room of Le Cirque restaurant in New York City.